The hedge trimmer enables high hedges to be trimmed without the need to use a ladder, making work safer and quicker. The head can be adjusted to 12 fixed positions making the cutting of the tops and sides of hedges a breeze. 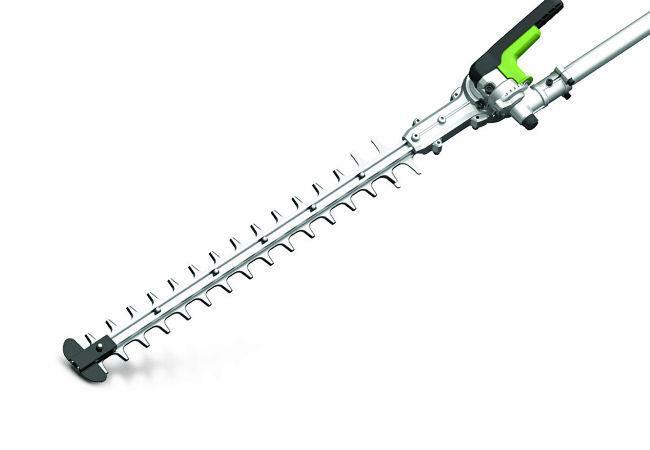 EGO Cordless Multi-Tool Hedge Trimmer Attachment - 51cm has an exclusive Mower Magic 5-Year Warranty, supplied to you free of charge. To read more about this exclusive warranty, please click here. The world is changing, fast. Our whole society is moving away from fossil fuels and adopting cleaner, greener energy. It’s why we believe it’s time for a new, smarter way to power through gardening and landscaping tasks. EGO Power+ delivers petrol-matching power, just without the noise, fuss or fumes. EGO’s industry-leading Arc Lithium 56v battery technology delivers a new level of performance, giving you the dependable power you need to keep working hard until the job’s done. Comfortable to use, with impressive run times and fast recharge it offers the ultimate in convenience. There are no trips to the petrol station for fuel and no more storing highly flammable liquids. Designed from the ground up to deliver petrol-matching performance, the EGO Power+ Arc Lithium 56v battery has an innovative design to maximise battery cooling. Unlike conventional brick shaped batteries where the cells are packed together, overheat and shut down, our unique Arc design dissipates heat more effectively.